Did you know that turtles are unusual for animals with backbones? They are one of only three vertebrate species that have shells. But where does the shell come from? When does it appear on a growing turtle embryo? And which animals are turtles most closely related to? The answer lies in the turtles’ DNA and genes. I’m a bioinformatician at the Wellcome Trust Sanger Institute working as part of the Ensembl team. 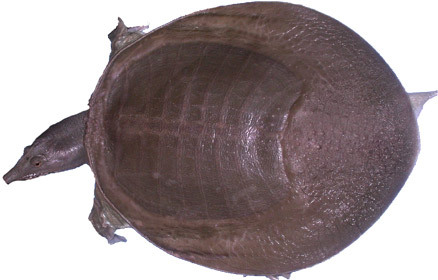 My team and I collaborated with researchers from RIKEN (The Institute of Physical and Chemical Research, Japan) and BGI (formerly the Beijing Genomics Institute, China) in the Joint International Turtle Genome Consortium to understand when the Chinese softshell turtle appeared in evolutionary history and how its shell develops. The results of the consortium’s research, published in Nature Genetics, show that a turtle’s shell is a late starter in development terms. Turtle embryos develop in a very similar way to most other vertebrates, it is only later on that the turtle-specific pathways are activated to grow the shell. We were also able to place Chinese softshell turtles on the evolutionary tree and support the theory that turtles belong to a branch that includes birds, crocodiles, and dinosaurs. Which came first: the chicken, the turtle or the largest extinction event on the planet? We sequenced the DNA from two turtle species so that we could understand which animals are most closely related to turtles. The more closely related two species are, the more similar the sequence of their genes will be. The BGI team pieced together the full genomes of animals from the thousands of short lines of DNA code that modern DNA sequencing techniques produce. This painstaking work of assembling genomes can be frustrating – sometimes it extremely hard to be certain which short fragment of DNA overlaps with another fragment, but the final results can be illuminating. Using the resulting turtle genomes, the teams at Ensembl and BGI were able to search for protein coding genes. This was the part of the project that I was involved with. I managed the Ensembl gene annotation project for the turtle. We predicted the location of protein-coding genes for the turtle by mapping known protein sequences from other animals to the turtle genome. This is a computationally expensive job and can take several months to complete. We also mapped the consortium’s gene expression (transcriptome) data to the turtle genome and incorporated these data into the gene annotation project. Turtle protein-coding genes were then compared with genes from chickens, crocodiles, lizards, dogs and frogs. By comparing how similar the sequences are, we can estimate how closely related the different species are to each other. We found that the turtle lineage split away from the bird-crocodile lineage about 250 million years ago. This date is the time of the Permian-Triassic extinction event: the largest known extinction event ever to take place on this planet. Could the emergence of turtles be related to this extinction event, which was particularly catastrophic for marine species? When all embryos develop, specific genes are switched on and off in a highly regulated fashion to grow the various parts of the body. Considering that turtles and chickens have a common ancestor, at what point does a turtle embryo’s development take a different path from that of a chicken embryo? We are able to explore this from a gene expression perspective by studying the activation levels of genes – known as the transcriptome. By using the latest technology – next-generation transcriptome sequencing – we found that the turtle and chicken embryo gene expression patterns start to differ after the vertebrate phylotypic period of development. This is the moment just before the shell starts to form. We looked at which genes are more highly expressed in turtle than chicken after the vertebrate phylotypic period, and where in the body these genes are switched on. We found evidence that the turtle embryo forms a shell by co-opting a gene expression pathway that is usually used to grow limbs. Our study also showed that turtles may have the ability to smell a wide variety of substances because they possess a very large number of olfactory receptors. We identified more than 1000 olfactory receptors in the Chinese soft-shell turtle, which is one of the largest numbers ever to be found in a non-mammalian vertebrate! While my role in this project was small, I really enjoyed the work. It was great to be a part of an enthusiastic and international consortium spread across eleven time zones including the UK, Germany, China and Japan. Luckily, conference call scheduling was made easy because our collaborators in Japan and China were willing to stay up late until the UK crowd got in to work. Wang Z, Pascual-Anaya JP, Zadissa A et al. The draft genomes of soft-shell turtle and green sea turtle yield insights into the development and evolution of the turtle-specific body plan. Nature Genetics 2013; 45: 701-706.